Teaching an infant or toddler to swim is not only a matter of safety, but also a great way to stimulate physical coordination, concentration, and intelligence—all the while making your child happier, healthier, and more self-confident. Based on the revolutionary learning principles developed at The Institutes for the Achievement of Human Potential, How To Teach Your Baby To Swim pairs 160 photographs with detailed instructions for teaching your child to dive, float, and swim. Douglas Doman is Vice President of The Institutes for the Achievement of Human Potential and the son of founder Glenn Doman. His early years working at The Institutes were spent establishing the School for Human Development for brain-injured young adults. He worked closely with Bruce Hagy to create the world’s first Human Development Course, a circuit of physical activities that promote neurological organization and development. They should have the opportunity to swim right from birth. In fact, swimming helps to stimulate brain growth and development at a critical time. Swimming also provides an excellent opportunity for the newborn baby to develop physically when it is difficult for him to move on land. It is especially important for the newborn baby to have the opportunity to move in the first few days and weeks of life. When born the baby has the advantage of being light in weight but the ­disadvantage of being inexperienced in movement. If given the opportunity to move each day, the baby will gain much-needed experience, but will also gain weight. This makes his job more difficult. The newborn is in a race against time. The baby must gain mobility function before he gains too much weight. Swimming provides an ideal opportunity for the newborn to move in an environment where he will actually be buoyant and where baby fat will be advantageous rather than making life more difficult. In truth the newborn has actually been “swimming” in utero for months. Swimming is one of the most sophisticated brain functions the baby has at birth. It is a fact that the brain literally grows by use. Swimming is one of many ways that we can provide sensory stimulation and opportunity that grow the brain. If we are smart about providing appropriate stimulation and opportunity, then teaching the baby will be a joyous process for mother and baby. It is common for the children we teach at The Institutes for the Achievement of Human Potential to be excellent swimmers, but they also excel in running, biking, gymnastics, and ballet by the time they are six years old. The sum of these activities is much greater than each alone. Since 1977 thousands of mothers have attended The Institutes How To Multiply Your Baby’s Intelligence course. These mothers returned home to help their babies develop to very high levels of brain function. Our work with brain-injured and well children has supported what we know to be true—all babies are “water babies.” The mission of The Institutes is to teach parents how to help their children reach high levels of physical, intellectual, and social ability. The Institutes is a research and teaching organization. It is our responsibility to create new methods to develop the brain of both the brain-injured and well child, and teach those methods to parents. This book is part of that process. 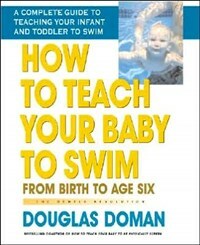 The baby will reap many benefits from learning to swim right from birth. He will develop better physical strength and coordination. These abilities will enhance the ability to crawl on the belly and to creep on hands and knees. Our babies are “floor babies” and they learn how to move against the force of gravity. It is truly a miracle in twelve months that the baby’s brain—which had very little information about moving in gravity—has developed intricate sensory and motor areas in such a short period of time. As a baby develops these mobility functions, breathing will become deeper, more regular, and more mature. This enhanced respiration helps the baby to be able to make sounds, which improves communication and overall language development. When the baby can move better, and breathe better, health also improves. When the baby is able to communicate better with mother and father, baby is happier and more content. These are all valuable “side effects” of learning to swim. The newborn progresses, becomes more confident, and becomes a true “water baby.” The baby learns how to handle himself in the water. Ultimately the baby will be much safer in the water than other children who may be twice the age. An adventure has begun from the newborn’s initial swim to the first walking steps. Along the way the baby will make a thousand mobility experiments to discover what to do and how to do it. Swimming is literally the springboard for this adventure and these discoveries. The objective of this book is to teach mothers and fathers how to teach their baby not only to swim, but to adore swimming. By so doing, the baby will gain many other abilities that will serve him throughout life.